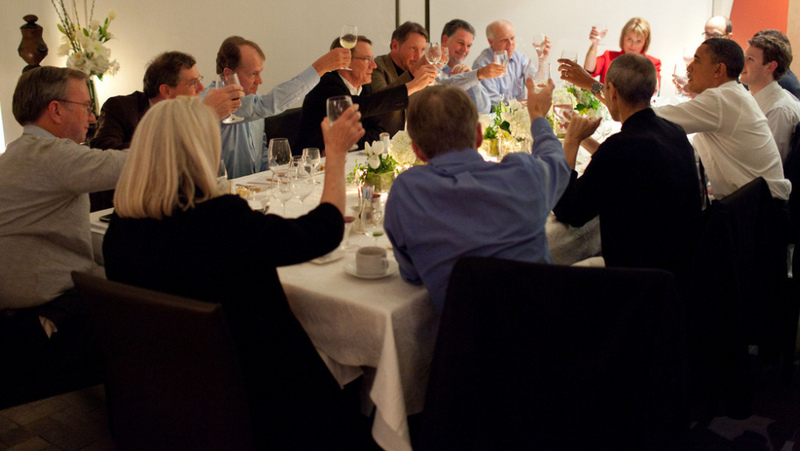 Photo: Apple's Jobs, Facebook's Zuckerberg Flank Obama At Dinner : The Two-Way Apple CEO Steve Jobs and other high-tech executives met with President Obama in California Thursday. As we said yesterday, the news that Apple CEO Steve Jobs would be among the high-tech execs meeting with President Obama last night was getting lots of attention because of the medical leave that Jobs is on and the ongoing interest among investors about whether he will or won't be able to continue leading the company. President Obama joins in a toast with Technology Business Leaders at a dinner in Woodside, California, Feb. 17, 2011. Apple's Steve Jobs is to the president's left. Facebook's Mark Zuckerberg is to the president's right. As for the meeting, The Associated Press describes it as part of Obama's "outreach to business leaders. ... Obama is pushing for new spending on innovation, education, high-speed rail, faster Internet service and other programs that he says will better position the U.S. to compete against other nations." It was held, AP adds, "at the Woodside, California, home of venture capitalist John Doerr. ... Obama and the innovators brainstormed ideas. White House spokesman Jay Carney said afterward that Obama wants to keep exchanging ideas with the group 'so we can work as partners to promote growth and create good jobs in the United States.' Over dinner, Obama discussed his proposals to spend on research and development and to expand incentives for companies to grow and hire, Carney said."